I have no idea why it took me so long to jump on this bandwagon, but I have a feeling I may be hooked. 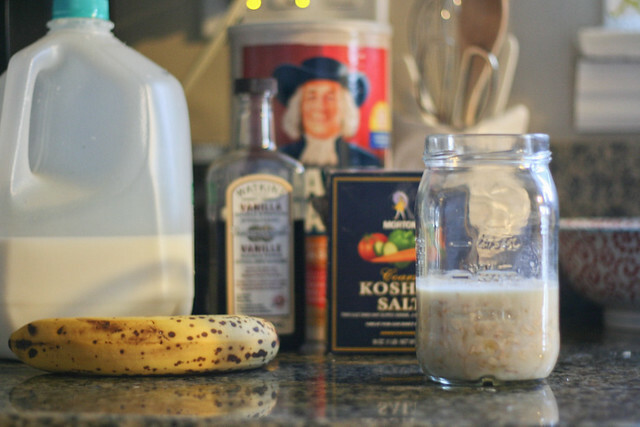 I recently realized I had a lone mason jar (er, recycled pickle jar) and a couple cups of rolled oats in our kitchen, and had the idea to make a few rounds of overnight oats and see how they turned out. For most of the past week, I've stuck to this breakfast (trying a few versions, which I'll mention below) and have found it to be so delicious, filling, and made with such simple ingredients (seeing "artificial flavors" on the box is something that bugs me about most instant oatmeal packets). I'm also someone who finds such comfort in routine, and I love preparing breakfast for the following morning every evening after dinner. I love knowing that there is something healthy and ready to be eaten right when I wake up! I'd gotten into the habit of filling up on my one cup of coffee, then making breakfast an afterthought (typically a bowl of cereal) a couple hours later. 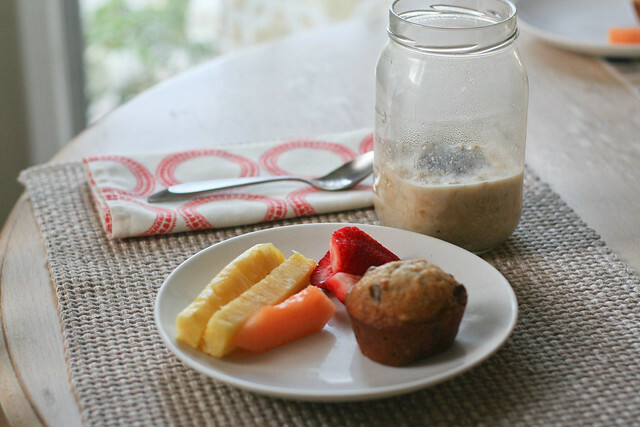 This is a much better alternative, especially because it helps limit my morning snacking! If you haven't tried this before, you really have to. Odds are, you have everything you need to make a simple version of this breakfast already in your kitchen. (I was surprised by how many versions I was able to make without needing to buy any additional ingredients!) I need to be on the lookout for smaller mason jars, because I've found the size of the one I typically use is a little ridiculous—considering the relatively small serving I make. Still, I do like the idea of reusing this jar in yet another way! I've been making an effort to buy more fresh fruit and always have it ready for snacking or to add to meals (especially good when you have a 3 year old who is constantly asking for snacks!) and am still obsessed with making large batches of these muffins and freezing a bunch so we always have some to eat with breakfast or for Jay to take with his lunch. Don't be fooled: I periodically have a sizable bowl of Reese's Puffs for breakfast. But I figure if the healthier breakfasts outweigh those, then it balances out just fine. 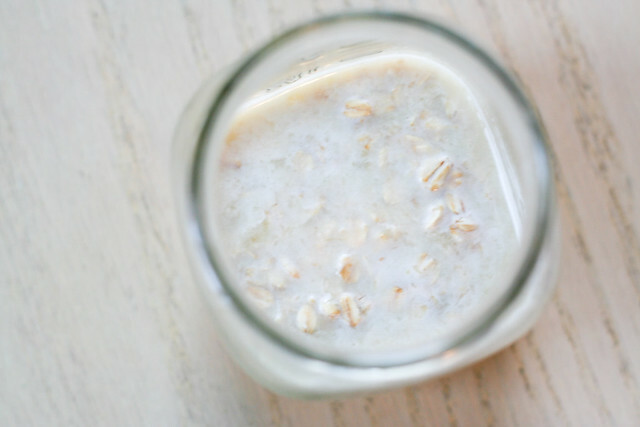 If you have your own favorite recipe for overnight oats, please share! This is one of my new favorite things, and I'd love to discover a few new recipes to switch it up here and there. Stir and put in the fridge (the consistency will be a little less wet and more chewy, which I prefer!). Top with diced apple in the morning and heat up in the microwave. 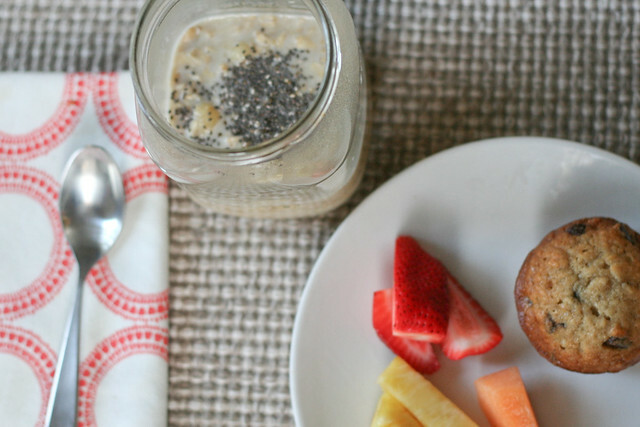 Chia seeds soak together with oats? Or sprinkle it in the morning?